The title of this post makes me sad. This past week was my last spring break…ever. I was able to travel a bit and spend some time at home. 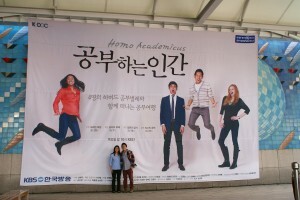 Spring break started at 3 am last Friday as I headed to the airport to fly to Seoul, South Korea! That weekend, I’d spend more time in the air traveling, than I would on the ground. I was only in Seoul for about 30 hours. It was the quickest (and longest) trip I’ve ever done. What an oxymoron. My friend (and former PAF–Peer Advising Fellow, or an upperclassman buddy that is assigned to each and every freshman! ), Lilli ’11, and I traveled together to shoot another episode of the Korean documentary we’ve been hosting for the past year. 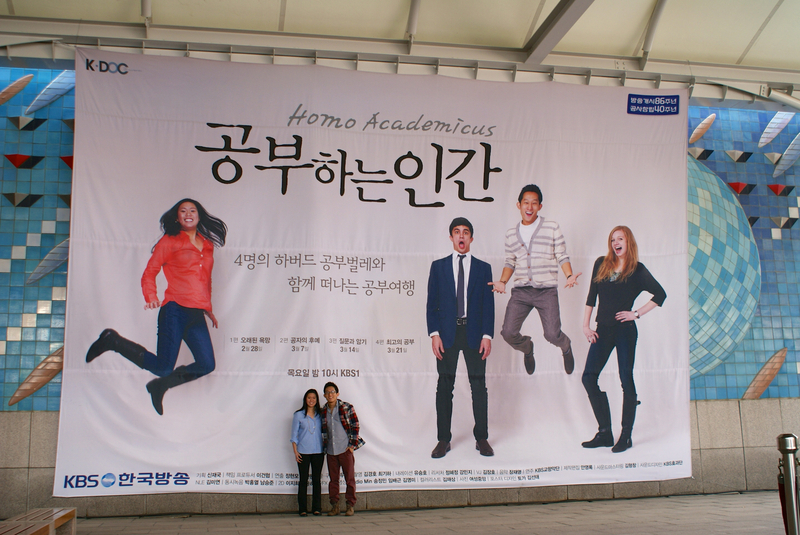 I’ve mentioned this before in previous posts, but to recap: “Homo Academicus” is an education documentary series consisting of 4 episodes that I’ve been co-hosting with 3 other Harvard students (Brian ’14, Jenny ’13, and Lilli). We traveled to various countries around the world to observe how cultural differences, privileges, and inequities affect education and styles of learning. One of the coolest things that I’ve done while at Harvard–definitely something I’ll remember for the rest of my life. It’s also something I would have never had the opportunity to pursue if it weren’t for being a Harvard student. Lilli and I in front of one of our promotional posters! The documentary premiered on February 28, and new episodes have been airing weekly on Thursday nights throughout March. The first episode had decent ratings, but the second one shot up to number 2 on the charts. As a result of the show’s success, our producers invited us back to film an epilogue of sorts as an episode 5, and thus, the 30 hour whirlwind trip to Korea occurred. The trip itself was as crazy and fun as it was exhausting. As soon as I hopped off the plane (a combined 18 hours of travel with my layover in San Francisco), I headed to a local cafe where we would be filming. We had a live studio audience of about 100 people, which was insane! One of the show’s viewers even drove 3 hours to be an audience member; what a trooper! While I’m on this high, let me just say that we were noticed on the street a few times, which was simultaneously both really funny and super bizarre. It felt like an out of body experience, but still very cool! Luckily, I haven’t been jet-lagged! I don’t know why. I think the trip might have been too short for me to adjust to any timezone–perhaps my body was just really tired and confused. My parents are moving to a new house, so I’ve been packing up my things and going through all belongings that I’ve lugged around for years and years. I haven’t grown in height since freshman year of high school or so, and therefore, I always tell myself I’ll wear something that is clearly no longer age appropriate for me. This cleaning really helped, though, because I sorted through my entire closet and donated 3 bags full of old t-shirts, sweatshirts, and pants! The best part was that I drove back to campus to pick up my friend, Teagan, who stayed at school for spring break, to join this adventure. The joys of being a (fairly) local Harvardian: campus is just a short 40-minute drive away. Massachusetts residents, I’m talking to you! Being able to drive back and forth to campus from home whenever you’d like is such a huge plus! I’m still in the midst of packing and am only home for one more day. Yikes. I should probably go do that now, but I’ve had a lovely last spring break that I’m sure I’ll look back on with fond memories. Crossing my fingers that it stops snowing! Also, HUGE congratulations to the Men’s Basketball team on a historic win in the NCAA Tournament! I have a few friends on the team and am so incredibly happy for them! Can’t wait to root for them when they play Arizona!